The story begins with the energy crisis of 1973 and ends with the Florida Solar Energy Center's 30th anniversary. 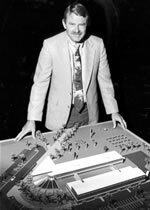 Reflecting back on the Center's 30-year history begins with a look at the '70s, when it all began. Started by the Florida Energy Committee and the Florida State Legislature in 1974, we were the first, and remains the premiere, state-supported energy organization. FSEC is a tribute to former Florida leaders and their wisdom and support. Please join us as we look back on our history, the people we've worked with, and how we've grown. This in-depth look at our history has been written by David Block, who served as director for 25 years and provided guidance for FSEC through our most turbulent and expansive years. The "History of the Florida Solar Energy Center" is available as a softbound book with a foreword written by Senator Bill Nelson. This book covers the growth of this organization, our impact on Florida's energy use, and the challenges still yet to overcome. If you're interested in this expansive review of our history, copies are available for purchase at the price of $25. Contact JoAnn Stirling at (321) 638-1014. As the urgency for clean energy sources increases, so do our efforts; this once humble agency commenced with support from the Florida Legislature and the University of Central Florida. A historical review of our programs from the 1970s is best presented from two perspectives - the thoughts of our employees, and a discussion of our research and programs. These programs were conducted as a part of our state activities and as funded by the federal government. After the photovoltaics (PV) program was established, the variety of energy research areas was increased. In addition, our successful buildings program branched into daylighting and solar cooling research. The building science program began looking at health issues such as indoor air quality, and as PV technology became widely adopted, we began researching PV applications. It was during this period that our hydrogen program began a rapid expansion, exploring production, storage, and usage techniques. The center is now composed of five research divisions: buildings, education, hydrogen, photovoltaics, and solar thermal.